News on this site, click here ! This software has been realised by and for the professionals of picture framing. It permits to calculate the sales price of a frame in a few seconds, and this with no computer knowledge. It also allows to print order forms and invoices, to update stocks automaticcaly, to archive the orders and sales, and maintain customer data. Improved since 1994 by interaction with customers in France, Belgium, Luxemburg, Switzerland, Germany, Italy, Holland, New Caledonia ... the latest developments are the passing of year 2000 and the EURO currency. But the new top feature is the possibility to display on the screen a simulation of the proposed frame including the customers painting (or poster). The only requirements are to use a PC with minimum a PENTIUM 200, 65000 color display with windows 95-98-2000-NT-XP-Vista & Win7. 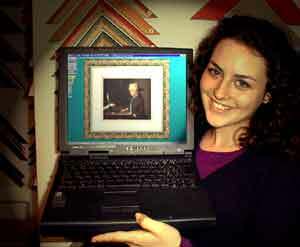 Also a digital photo or camera or webcam to record the painting, and a low cost scanner to scan your mouldings. NEW ! Click here to see a presentation film of the software. !